As Marie delightfully pointed out last Saturday, it was my birthday. Despite coming from a large family, I got an underwhelming amount of gifts for my - ugh - 29th birthday. We had a little party at my brother's house that including red velvet cake Marie bought for me and plenty of food. Mind you, I asked for the party at my brother's house in New York, which is two hours away from where I live. My boyfriend bought me gifts, which I could never complain about. My parents gave me money. However, I am going to show off the gifts Marie got me because, well, they're awesome. 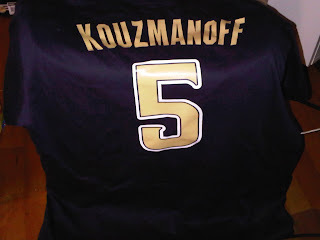 First in the gift bag was this Kouzmanoff t-shirt. I've wanted for a while, but I figured since my family and friends know me so well, someone would eventually buy it for me for a birthday or Christmas. This was the biggie present. I knew what the object was when I saw the box. You kind of don't have a choice, but I didn't know exactly what it was. My first guess was that it was a Louisville Slugger with my own name on it. That's a pretty cool gift and do those kind of things. However, I was much happier with what was actually in the box. 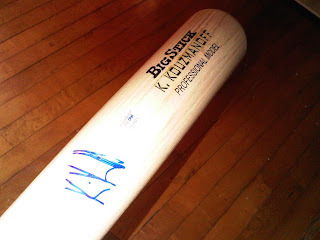 It's a Kevin Kouzmanoff signed game-used bat. 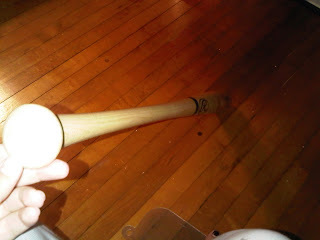 Marie got me Kouz's Big Stick for my birthday. I couldn't be happier. I think my boyfriend is getting sick of Marie's presents. Nice bat and it signed. Kouzmanoff is an underrated player not many people know about. I'm number one, I'm number one! Your boyfriend has some big shoes to fill... LOL! !